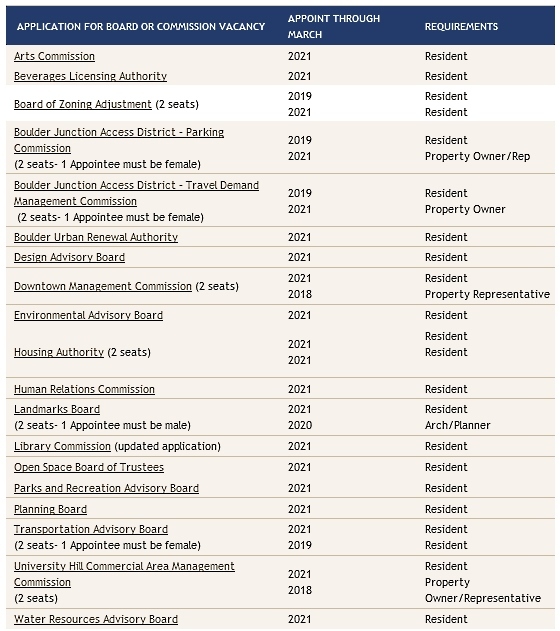 In case you haven’t heard: The City of Boulder is recruiting city residents to serve on its many volunteer boards and commissions. Serving on a city board or commission is one way to give back to your community and participate in some tough, but critical, decision making. The city needs your expertise, your perspective and your dedication. In return, you will have the opportunity to advise City Council on policy and influence some important outcomes. You’ll be floored by the eloquent testimony offered by Boulder’s engaged residents, learn from the city’s knowledgeable and hardworking staff, and ultimately emerge with a more nuanced understanding of the motivations, constraints and trade-offs faced by city decision makers. You will also get an EcoPass. Please consider applying for one of the volunteer positions listed below. You will need to act quickly: The 2016 annual recruitment period will close on Thursday, February 18 at 5:00 p.m. Application information is available on the city’s website.